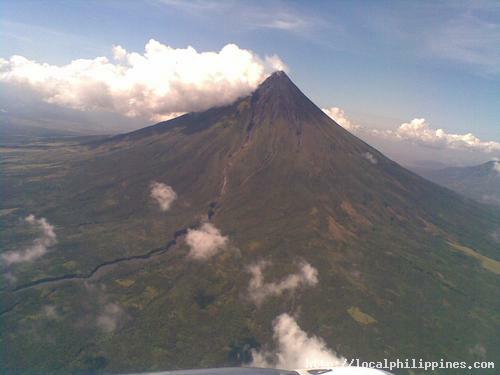 Mayon Volcano is the main landmark of Albay Province, Bicol Region. It is 10 kilometres (6 mi) from the Gulf of Albay, in the municipalities of Legazpi City, Daraga, Camalig, Guinobatan, Ligao City, Tabaco City, Malilipot, and Santo Domingo (clockwise from Legazpi). Mayon Volcano is touted as the world's perfectly formed volcano for its symmetrical cone. It stands majestically at 7,946 feet from the broad base about 10 km. in radius. The crater is 2,541 meters above sea level and with a diameter of .5 kilometer. It has a notched rim where a pool of building hot lava boils and rich coal deposits could be found. Sulfuric streams and gases continually emit from this crater. Mayon Volcano also called Mount Mayon derived its name from the word magayon, meaning beautiful. Its name has been regarded as the symbol not only of Albay but also of the Philippines within the Orient. It is also the most active volcano in the country. Since, 1616, Mt. Mayon was recorded to have erupted 49 times and the worst was on February 1, 1814 which buried the settlements of Cagsawa and Budiao in the town of Daraga. The latest recorded eruption was in February 2, 1993. The latest activity of Mayon was on December 14, 2009, when it spewed lava and ash that reached a height of about 100 meters (330 feet). The remaining half of the month of December then became a flurry of evacuations and close watch. Mayon however didn't erupt, but quieted down as the year ended.